One Yoga Center offers a diverse variety of Yoga styles and classes allowing you to discover the type of class that meets your needs and interests. The majority of the classes at OYC combine the beautiful practices of classical Hatha (physical postures) Yoga with other therapeutically oriented practices that address the needs of the individual and Vinyasa (flow of sequenced movement) to provide a moderately paced practice for body, mind and spirit. For class schedule, class descriptions, holiday closings, fees and information for new students, read on. If you have questions that are not addressed below, feel free to contact Ellen via telephone at (401) 368-YOGA (9642). Please note if the Foster-Gloucester school department cancels school for snow there will be no morning classes on that day. Holiday Closing: We will be closed for a holiday break between December 23, 2018 to January 1, 2019 – Full schedule resumes on January 2, 2019. These classes are for everyone, including beginners. The teaching style is adapted for those in attendance. When beginners are present the detail of instruction is more pronounced, allowing new students to easily follow the class. Typically, this is a moderately paced class which emphasizes focused breathing and a mindful awareness of your body. This emphasis makes this class a joyful, meditative exploration of yourself in the present moment. Students find this class both relaxing and revitalizing. This class is designed for students who have a fundamental understanding of Yoga postures and alignments. A minimum of 8 weeks of prior Yoga experience is suggested. In this class you will be offered the opportunity to explore the inner workings (the meditative movement) of Yoga in more depth, while experimenting with longer holds and more challenging variations of postures. The level of the class ranges from moderate to refreshingly vigorous. Focused breathing and mindful awareness of your body set the stage for a deep meditative experience which will leave you feeling relaxed and revitalized. Vinyasa yoga emphasizes a continuous flow of movement using sun salutations, dynamic breathing and long holdings. Each part of the body (inside and out) is explored and worked in a deep and mindful way. This practice builds strength, tones and detoxifies. Vinyasa is a fun and creative practice requiring focus and dedication. This class moves at a quick pace; therefore, some Yoga experience is helpful prior to starting this class. This type of Hot Room Yoga is physically challenging and athletic. A moderate level of fitness is recommended. If you have specific health issues or injuries, you should consult your physician and the teacher before engaging in these classes. Room does not exceed 83 degrees. More typically 78-80 degrees. This is a class for those interested in a Vinyasa style class ( see above) without the heat. Flowing movement combined with longer holds and deep core work will surely hold your interest and offer a challenge. This class can move at a fairly quick pace; therefore, some Yoga experience is helpful prior to starting this class. A moderate level of fitness is recommended. If you have specific health issues or injuries, you should consult your physician and the teacher before engaging in these classes. This is a slow to moderately paced class which encourages you to define and explore the unique needs of your body on each given day. Modifications of traditional postures are offered so you can find the perfect way to engage a pose, for your body. People recovering from or learning to live with a variety of injuries and health issues find this class the perfect way to involve themselves in their healing journey. People looking for a meditative and restorative class also find this class ideal. Yoga offers as much for the prevention of illness and maintenance of health as it does for the healing process. Enjoy a gentle and effective class that offers all the benefits of Yoga without having to get up and down from the floor. Enjoy movement from a seated position as well as from standing (with the support of the chair). Students taking this class report increased mobility, improved respiration, better posture, greater ease when walking and improved ability in dealing with stress. 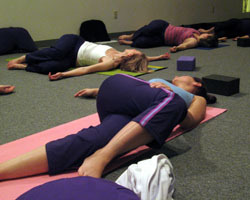 Restorative Yoga combined with specific breathing techniques has been shown to ease the challenges of anxiety, depression and trauma. When practiced on a regular, daily basis, it is possible to experience a significant improvement in the quality of life. This class is designed to offer you the opportunity to learn and practice these techniques in a group setting on a weekly basis. Students will be encouraged to commit to a 1/2 hour home practice in order to discover how Yoga can help restore balance to your life. A take home practice will be given to students and we will check in at the beginning of each class to see how practice is going. You do not need to be diagnosed with anxiety, depression or trauma to participate in this class. It is a perfect class for anyone to unwind from the stressful aspects of daily living. Restorative Yoga utilizes props to promote comfortable, long holds in poses fostering passive muscular release and deep relaxation. No previous Yoga experience is necessary. Pre-registration is required for this class. A minimum of 5 students is needed to run the class. Once the class establishes a core group of 5 walk-ins will be welcome. Don’t hesitate to call to see if we are meeting. Folks with diagnosed mental health and physical health conditions are always encouraged to check with their physician prior to attending Yoga classes. This class is not currently in session, please contact us if interested. Iyengar style yoga classes are offered at One Yoga Center with Kathleen Swanson and the Yoga Room. For more info visit theyogaroomri.com/. $10 for any class – Available to college students or anyone under 18-years-old. $65 for a 1-hour private class (by appointment only). OYC encourages everyone to practice Yoga with us. If financial challenges impact your ability to pay, we will understand. Let us know and we will adjust payment to meet your needs. A donation or work exchange are always options. It is essential to the mission of One Yoga Center that new students feel welcome and comfortable at the center. We offer introductory pricing for new students (see above) and we have mats and cushions that can be used, free of charge, for all students. For reasons related to health and hygiene, ongoing students are encouraged to purchase their own mat. The Gentle Yoga and Everybody classes are most suitable for beginners. Students should wear loose, comfortable clothing to class. Pants or shorts with an elastic waist are ideal — no big buttons or belts. Dress in layers, particularly if you have a tendency to be warm or cool. Eat lightly – if at all – 1-2 hours before class. It is always good to drink a lot of water, but it is especially good before and after Yoga class. Please make every effort to arrive at class on time. The studio is open to receive you 15 minutes prior to start time. Know that every effort is made to begin and end class on time. Late arrivals and early departures are distracting to other students. These beliefs inspire the teachings at One Yoga Center, thus bringing an emphasis and respect to the needs of the individual in regard to their age, their level of wellness, and their personal goals for health and fitness of the mind, body and spirit.